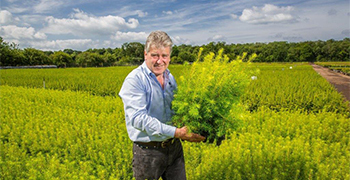 Founded in 1988, Alba Trees has become the UK’s largest producer of cell-grown plants - producing up to 12 million trees per annum. 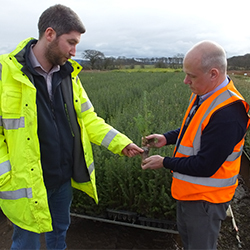 Operating from two sites totaling 13ha in East Lothian, near Edinburgh the nursery produces an impressive range of native species for environmental forestry schemes as well as commercial and productive conifers and hardwoods. A leading supplier to the farm woodland, hedging, reedbed and conservation sectors, this has led to diversification in to shrubs, wetland plants and wildflowers as well as sundry items including tree shelters. A retail site processing small orders enables the general public to buy trees on line. As well as the forestry industry, Alba also supplies the royal estates as well as other large estates and forest management companies, charitable and heritage trusts and the landscaping sector. Rodney Shearer is Managing Director and was one of the founding directors at Alba. “As production grew and became increasingly sophisticated we started to look around for a more consistent, quality growing media,” he says. “Having conducted a series of in-house trials we were particularly impressed by the overall high performance and consistency of Levington Advance growing media mixes, and switched to ICL. Having invested in a big bale handling system the growing media is now delivered in pro-bales. For the nutrition programme Rodney has put his trust in Osmocote controlled release fertilizer, pre mixed in to the growing media. General Manager Chris Allan joined Alba in 2014. “We run a busy operation and put great value in the quality of service we receive from our suppliers. With our scale of production we cannot afford for the quality of the growing media to fluctuate or for the supply to be unpredictable. We regularly sample loads delivered as part of our LEAN management programme to ensure sustained quality. With ICL the communication is always good and the growing media, nutrition programmes and plant protection products come well supported by Ian Todd and his colleague Andrew Wilson.